When you or a family member needs immediate medical attention it is natural to go to a hospital's emergency department. Emergency room physicians and health care staff usually provide excellent care. Sometimes mistakes and errors can occur. Many times emergency rooms are overcrowded with patients seeking medical attention. Our experienced Chicago medical malpractice lawyers know that sometimes these ER's are understaffed and overworked. The combination of these two can lead to medical mistakes and errors made by health care providers. The results can be catastrophic for patients. Many times, patients are misdiagnosed in emergency rooms. Often times, there is a failure to diagnosis or delay in diagnosis of a medical condition. Physicians and health care providers in the ER need to make split second decisions. As experienced Chicago medical malpractice lawyers, we have seen many times, that failure to make the appropriate decision can prove fatal for patients. When emergency room physicians and nurses make errors the results can be catastrophic. If you or a loved one has been the victim of emergency room error, you need an experienced Chicago medical malpractice lawyer to represent you. 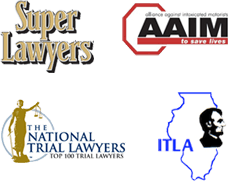 David Nemeroff has been recognized as one of the Top 100 lawyers in the State of Illinois.